Russian President Vladimir Putin created a stir recently when he shared his thoughts with Americans in an op-ed printed in The New York Times. According to The Times, very few pieces written by heads of state have been published by the paper and very few received the attention Putin attracted. But will the plea be influential? Will it change President Barack Obama’s or Americans’ opinion on the matter of Syria? In recent years, Russia’s political stability and rule of law have been called into question, causing many investors to avoid the area. Yet, while Russia is a tough market to love and even easier to hate, the country is hard to ignore, says Tim Steinle, portfolio manager of the Emerging Europe Fund (EUROX). While I was at Cambridge House’s Toronto Resource Investment Conference talking to investors about gold and resources, Tim was in San Antonio, Texas discussing his perspective on Russia on Canadian Business News Network with host Howard Green, Richard Jenkins from Black Creek Investment Management and John Hsu from John Hsu Capital Group. It was an insightful debate on finding opportunities in the sometimes challenging emerging countries of Russia, China and the Middle East. Here is a summary of Tim’s perspective on the emerging Europe giant. Q. A lot of big, sophisticated, institutional investors say it’s not worth the trouble to put your money in Russia. What do you say to them? Since the Federal Reserve suggested ending its bond purchases, many emerging markets have suffered. Year-to-date through September 12, the MSCI Emerging Markets Index lost about 8.5%. Over the same time frame, Russian stocks have declined less than that, about 4%. The Russian ruble also fared relatively well against emerging market currencies, as the country does not depend on external funding. 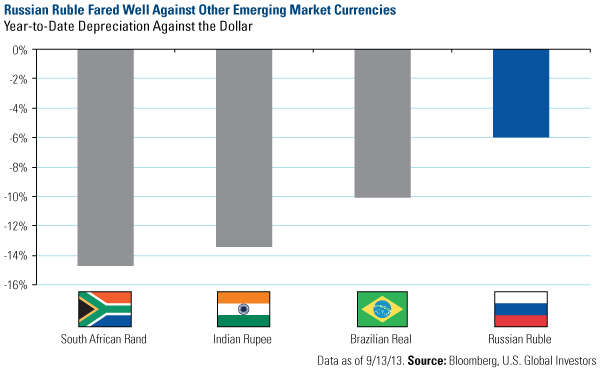 Since the beginning of 2013 through today, the South African rand declined more than 14%, the Indian rupee lost 13% and the Brazilian real is down 10%. Comparably speaking, the Russian ruble looks stable. Additionally, over the last 60 days, Brent crude oil increased about 15%, and a major oil-producing country such as Russia benefits from higher oil prices. For these reasons, we believe people are taking another look at Russia.